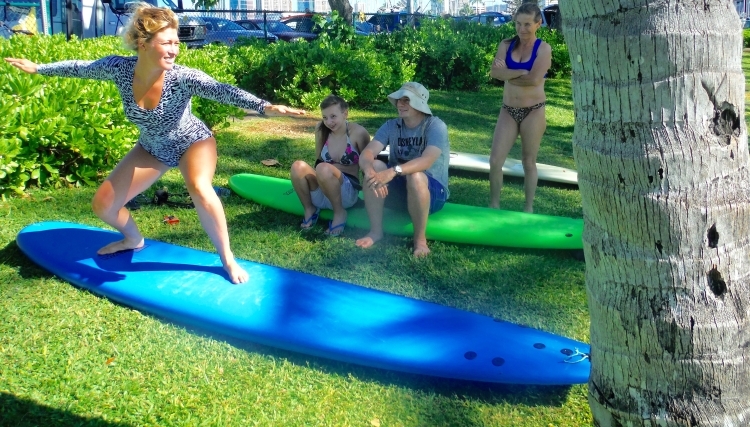 Nancy and her team will have you well on your way to riding waves in your first lesson. All classes and clinics focus on water safety, ocean awareness, the best techniques to spring your surfing to the next level, and make sure you know the rules and respect as a surfer. They are conducted in a fun, relaxed atmosphere, in uncrowded beautiful ocean conditions. To ensure safety all students must be able to float, swim and be comfortable in the ocean. Excellent soft surfboards, apoxy surfboards or fiberglass surfboards are provided depending on your level of surfing. Fiberglass short or long surfboards are available for the experienced surfer. (Please advise what size board you ride normally) This is in case you don't want to travel with your own boards. We provide UV rash guards to protect each student from rash and sunburn. Please DO NOT wear lotion or oil on the front of your legs (it makes the surfboard very slippery). We do however advise you to apply sunscreen on your face and other parts of your body 30 minutes prior to the commencement of your class or clinic. FYI Please wash your hands good after applying sunscreen so your hands won’t be slippery when grabbing the rails while surfing. Reservations essential for private group, semi private, private lessons or surf clinics and surf guides. Surfing time depends on tides, swell, wind conditions and participant’s requests. Customized programs available for hotels, conventions and corporate team building events. Students with special needs most welcome – Children 5-9 years, hearing/visually impaired or handicapped. 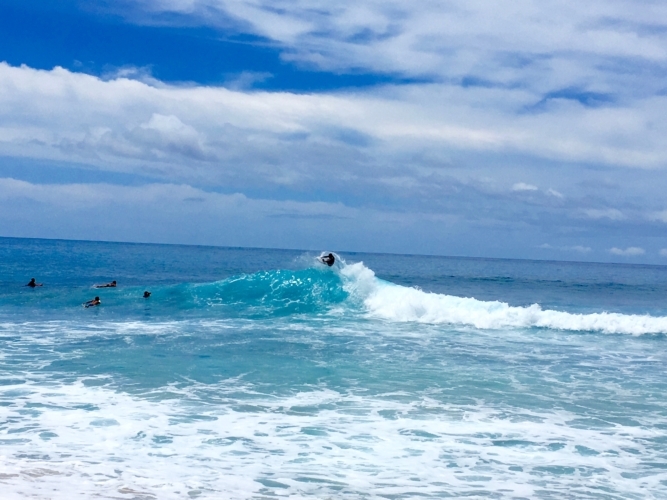 Surf clinics run all-year round upon availability. All instructors are personally trained and certified by Nancy Emerson. Accommodation and transportation can be arranged. Please arrive 15 minutes prior to your scheduled class time to ensure that you find parking and our exact location. Participants under the age of 18 years will need to make sure a parent or legal guardian is present to sign Waiver of Liability form. We can if time allows arrange to fax or email this form before hand if guardian will not be in attendance. Payment by way of Internet bank transfer, international bank wire transfer, cash and U.S. travelers checks. If outside of 60 days, Visa, Mastercard and AMX are possible with people outside of Australia and New Zealand. In Australia we do not accept credit cards. Nancy Emerson, Aloha Surf Clinics and Gold Coast Australian School of Surfing T-Shirts and stickers are available for purchase. Nancy Emerson School of Surfing and the Gold Coast Australian School of Surfing have Gift Certificates for Surf Lessons and Clinics are available. They are good for 4 months from the date of purchase. Thank you for booking and scheduling your surfing lesson or surfing clinic with Nancy Emerson School of Surfing, Aloha Surf Clinics, and the Gold Coast Australian School of Surfing. If you have booked one (1) two hour class we require 72 hours cancellation notice, if not there is no refund. Please call ahead to avoid a no refund situation, because space is limited. Thank You very much! Exceptions to this policy cannot be made for any reason, including weather or personal emergencies. But sometimes if there was no turning away surfers, Nancy can offer another dates for you to return. Exceptions to this policy cannot be made for any reason, including weather or personal emergencies. Please be advised: There is no refund for arriving late or leaving a surfing clinic early. On the rare occasion when Nancy Emerson School of Surfing, Nancy Emerson Surf Clinics or the Gold Coast Australian School of Surfing must cancel a surfing clinic, all payments will be refunded. Nancy Emerson School of Surfing, Nancy Emerson Surf Clinics or the Gold Coast Australian School of Surfing is not responsible for expenses incurred in preparation for any cancelled surfing clinics, such as costs incurred due to travel delays, airline tickets, flight cancellation or illness. All students/surfers who fail to sign the “Waiver of Liability” and personal information forms prior to the start of the surfing clinic will not be able to join the surfing clinic and the cancellation policy applies. 45-59 days prior to start date of your clinic, we will refund any monies paid less 60% of your total cost of your clinic. If we can move you to another date, we will.